With an intellectual brilliance which characterizes all that Dorothy Sayers has written, whether in the religious field or that of the mystery, this is a trenchant consideration of dogma, and its value as the basic structure of the Christian faith. 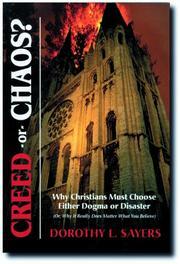 "If the 'average man' is going to be interested in Christ at all, it is the dogma that will provide that interest. The trouble is that in nine cases out of ten, he has never been offered the dogma. What he has been offered is a set of technical theological terms which nobody has taken the trouble to translate in the language relevant to ordinary life." This "trouble" author Sayers takes, and, in seven chapters -- miscellaneous in subject --, she conveys the drama of dogma...A highly individualistic, stimulating exposition with much spiritual significance as well.